He opened his eyes in the family of teachers in 1969 in Narimanli village of Goyche region. After finishing school with excellent marks, the same year he entered Azerbaijani State Polytechnic Institute (present day Technical University). And as soon as he finishes first course of the university he was called to serve in the army. Shovgiyar returned to Baki in 1989, after he completed his military service in tank troops in Mongolia. It was the time when Azerbaijani - Armenian conflict had already begun. When Shovgiyar saw hundred and thousands of our compatriots being banished from their mother lands such as Garabagh and as well as Western Azerbaijan, he was forced to interrupt his studies and embark the flames of fire. In the beginning of 1992, he enlisted in the National Army of Azerbaijan and was assigned as a commander in the tank brigade organized in Aghdam. The tank brigade chose their position in Abdal - Gulabli village. In the spring of 1992 there were bloody battles going on in for the sake of the villages such as Papravend, Aranzemin and Pircamal. Shovgiyar showed personal bravery and valor in these battles. 23 August....... the tank of Sh. Abdullayev was protecting Abdal - Gulablivillage - a place of strategic importance. But for some reason he was taken from his post there and was sent to Aghdere. In the battle that was for the village Dranbon nearby Serseng river Shvgiyar's tank was shot several times. The tank commander that was wounded from both legs was taken to Aghdam hospital. As soos as he slightly recovered he returned to the front again. On 27th August of 1992 he saved his friends from being captured by the enemies in a severe battle. But he himself, while showing a heroic example in the war for his country, embraces eternity. 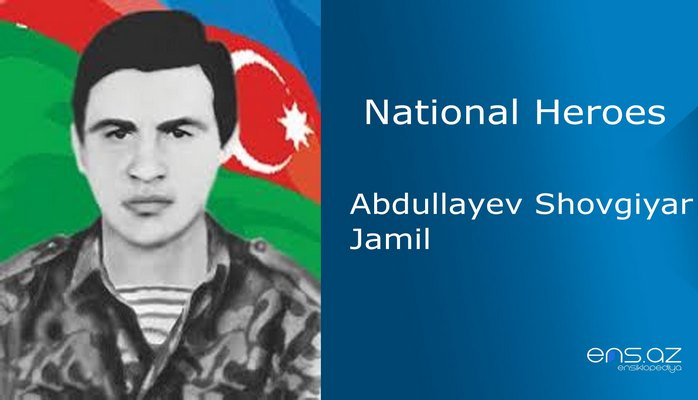 AbdullayevShovgiyarJamil was posthumously awarded the title of "National Hero of Azerbaijan" by the Decree No. 457 of President of the Azerbaijani Republic on February 5, 1993. He was buried in the Alley of Martyrs in Baku.